All that warm, toasty air is seeping out from your house by the minute! This is not an uncommon problem for old houses. But it can be a costly one. The more old homes leak warm air, the more energy (and money) it takes to heat them back up. You need reliable home heating options that both warm and preserve heat without driving up your bill. Keep reading to learn more about available options. Some may even surprise you! You’d be surprised by how much warm air is lost to small gaps and cracks in your house. The biggest culprits here are your doors and windows. The first thing you should do is seal up gaps at the bottom of your doors. A simple solution is to purchase, or make, a cushy draft stopper to place at the base of your door. If you make your own draft stopper, make sure to put some beans or micro-beads at the bottom to weigh it down. Next, look for gaps around your windows. These are notorious for leaking warm air in winter. Like your doors, you can also purchase draft stop cushions for windows as well. How can you tell if your home needs better insulation? Walk outside. What does your roof look like after a snowfall? If the snow on your roof quickly melts, that means your old home is leaking precious warm air. This is a tell-tale sign that you need to insulate! However, don’t forget about the importance of ventilation when insulating your home. Old homes, especially, need proper ventilation. Otherwise, moisture and humidity can build up and lead to mold. Smart technology is leading to some pretty innovative home heating options. If you’re unable to control and program your home heating, it’s time to get a new thermostat ASAP. 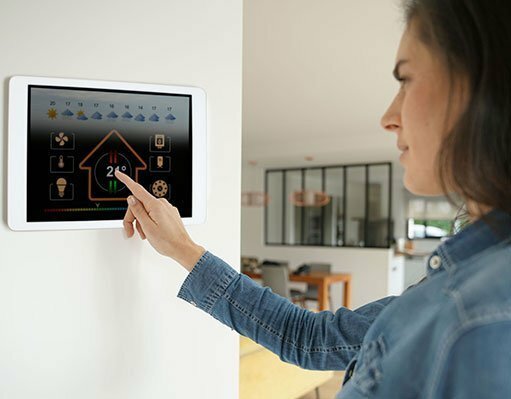 Programmable thermostats let you control your central heating by setting your own heating schedule. For example, you could program your central heating system to fire up in the morning and cool down in the evening. Curtains are more versatile than you think. In fact, they’re one of the easiest home heating options for old houses. To trap that cozy, warm air inside, simple cover your windows with thick weighted curtains. This is especially helpful on frigid cold days. On warm winter days, feel free to draw your curtains to take advantage of the sun’s warming rays. As the day cools down, close up your curtains to contain any natural heat from the day. This is a great way to give your central heating system a rest during winter. There’s no better time to start saving money on heating than winter. Use this quick and easy guide to weatherproof your home and get the most out of your central heating system. For even more home heating options, call a professional to fully prepare your home for the harsh winter months ahead.